The port is situated in the heart of the town – near shopping, restaurants and activities. Honningsvåg is the administrative center of the municipality and the port of Honningsvåg is the largest cruise port in Northern Norway and the gateway to the North Cape. The five piers are all within walking distance (5 min) of town. Sometimes you will be tendered in, depending on how many (large) ships are docked. The pier area is a pretty busy place with all kinds of shops (some run by indigenous peoples). The area is also populated with a key Norse Mythological figure, the troll. The town Honningsvåg is 34 km south of Nordkapp. An half hour drive by car. The midnight sun may be enjoyed 14 May-29 July. Web cams of Honningsvåg and North Cape. Honningsvåg Port is the gateway to the North Cape. It is the largest cruise port in Northern Norway with about 100 cruise calls during the summer season every year. The port can accommodate four cruise vessels at the same time, close to the town center. Honningsvåg boasts an extraordinary deep-water harbor where even the largest cruise vessels can tie up right next to the fishing harbor. Vessels can enter or leave by day or night without difficulty. Due to its important location and good infrastructure, Honningsvåg is a major port in northern Norway. Bounded by the Barents Sea, Nordkapp, Norway's northernmost municipality, comprises Magerøya island and the mainland surrounding the mouth of the Porsanger Fjord. Honningsvåg is the administrative center of the municipality. Nordkapp is also a major fishing municipality, attracting thousands of commercial fishermen from other parts of the country during the spring cod season. You will find major fishing villages in the neighborhood. 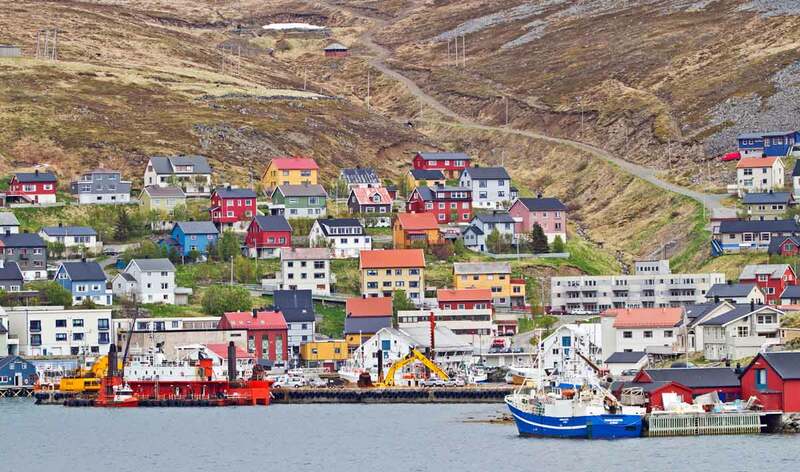 Inhabitants of Honningsvåg are known for their sense of humor, quick wit and urban life style. One of the Nordic countries' main attractions is without a doubt the midnight sun, which can be seen in the North Cape area from the middle of May until the end of July. The sun disappears completely beyond the horizon on 20 November, not returning again until 22 January. Honningsvåg Port itself has not much to offer. With only 2400 inhabitants it is smaller than an average cruise ship! The church is the only building left standing after the 2nd World War. Today the church is the oldest building in the area. A white wooden building, built in Neo-Gothic style in 1885. North Cape museum is a smaller museum with friendly atmosphere and presents Arctic fisheries and aspects of daily life of the coast of Finnmark. The museum is situated at the cruise port. Most cruisers book an excursion to the North Cape. A round trip costs about 65 Euro. Caveat: the weather may not cooperate and it may be foggy and there will not be much to see at the North Cape. On a nice day the view from your cruise ship of the North Cape is great while sailing in and/or out through the Barents Sea. Bring your binoculars. The municipality reaches out over 924 km² of grandiose and harsh coastal nature. Europe's northernmost point, the North Cape rises to a majestic 308 meters above the Barents Sea. North Cape has always been an important point of orientation for sailors in the northern areas and a big attraction for people from all over the world. In Honningsvåg you can have the ultimate experience in King Crab Safari – either by bus or by deep sea rafting. Learn about this famous creature's life – participate in taking out King crabs from the tanks on shore and teach how to cook it. Prepare a small meal of King crab and you can enjoy a taste of this special delicacy. Wifi spots are few, follow the crew to find one. Half way mainstreet just up from the Libris bookstore is a popular WiFi spot. At the tourist office there is one free internet terminal.